Wood Handles 3 Blade. Stainless steel blade has great snap with little wear. Good overall used condition, with little pocket wear. A new invoice cycle will begin after that. show signs of light use & wear. Hi! Welcome to Weaim2pleez. Here is a Winchester Brown Trapper Knife. Measures 3.75" closed with stainless steel clip and skinner blades. Brown checkered bone handle. Winchester bullet shield and ringed, pinched bolsters with nickel silver pins. Item #wn2904c. BRAND NEW in collector cigar style box! BUY IT NOW!! . Hi! Welcome to Weaim2pleez. 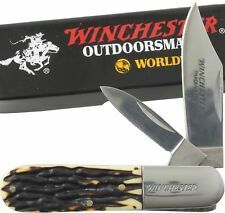 Here is a Winchester Stag Barlow Knife. Measures 3.25" (8.3 cm) closed with mirror finish stainless clip and pen blades. Imitation stag handle. Nickel silver bolster. Item #wn14011. BRAND NEW in box! BUY IT NOW!! . "NRA National Riffle Association" marked on the front blade. razor blade, not sharpen. light scratches markings on the blade. few light rust stain marking on corners. 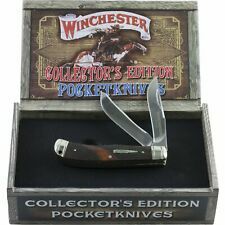 WINCHESTER THREE BLADES POCKET KNIFE BROWN WOOD HANDLE-SKINNING KNIFE. New never used. Out of packaging. Check out my other items. International Buyers: Most items are shipped using regular airmail which offers no tracking. If you would like a tracking number please e-mail us to upgrade the shipping to a tracked service before you send your payment. All import duties, taxes, or charges are not included in the price of shipping and are the buyers responsibility. Please check with your customs office to find out what these charges may be before bidding. Please be sure the item you purchase will clear customs. We will not be responsible for items that won't. If the item is returned to us you will receive a full refund minus a 10% charge. If you do not receive the item and it is not returned to us you will not receive a refund.